Posted by flashlightblog in Book News, Reviews, Winter. Image from Pobble's Way, written by Simon Van Booy, illustrated by Wendy Edelson. What’s nice about Pobble’s Way (Flashlight Press, $16.95) by Simon Van Booy is that on a winter walk a father’s flights of fancy match his daughter’s, and the two play off each other. To him, a leaf is a butterfly raft. To her, a mushroom is a frog umbrella. 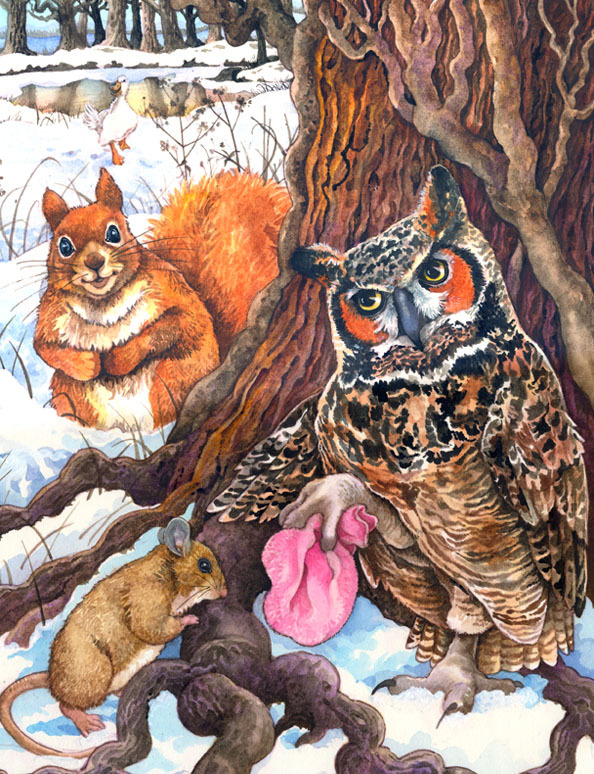 And the exercise in imagination extends to a menagerie of woodland animals who, in a furred and feathered Rashomon effect, take turns deciphering what a dropped pink mitten actually is. The options: cotton candy, a mouse house, a wing warmer, a fish coat, or a carrot carrier. There’s comedy, too. A mitten? 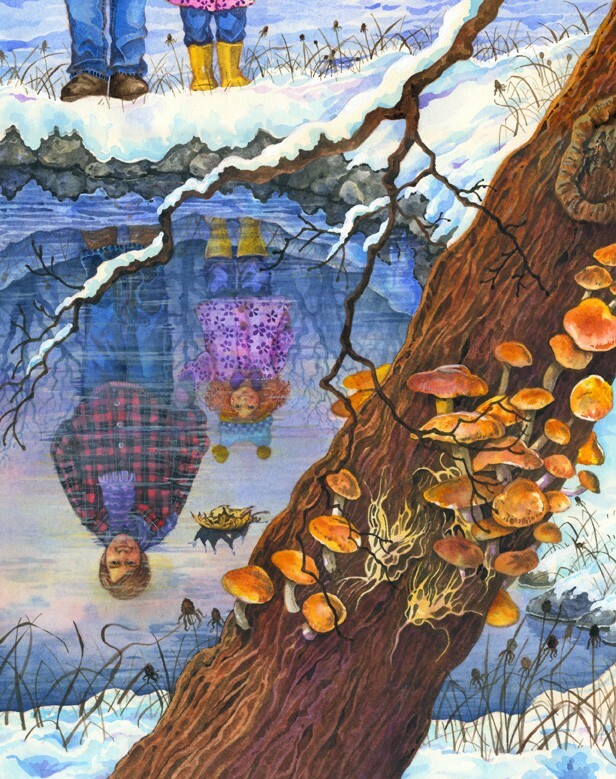 Wendy Edelson’s illustrations, in watercolor glaze, capture the woods’ profusion of life. She hails, not surprisingly, from Washington’s Bainbridge Island, where the wildlife is indeed wild and the greenery so green it practically throbs. She includes charming endpapers showing where each of the animals makes its bed. Which is where they retreat to as the story, set after dinner but before bedtime, comes to hint at the eternal parental struggle to get a child to sleep. At last, a kids’ book that explores life in the car. It occupies so much of a parent’s time, energy, and worry — from negotiating harnessed safety seats worthy of the Space Shuttle to the use of rolling motion as sleep inducement, and what do you do when the kid’s asleep and you have to run an errand? — you’d think they’d have proliferated like so many side-impact air bags. My Side of the Car (Candlewick Press, $16.99), by Kate Feiffer with deft pencil-and-watercolor illustrations by her father, Jules Feiffer, is about a long-delayed trip to the zoo that gets put off yet again by rain. Complication ensues when little Sadie notices that it’s falling on only the driver’s side of the car. Her dad splashes through puddles and can barely see past the wipers, but out Sadie’s window it’s all garden parties and sunflowers. Is it merely wishful thinking? To investigate, Sadie steps out of the car and into mud up to her pink stockings. On his side, anyway. She relents. But one good turn deserves another, and they don’t get far before the sunshine crosses the (psychological?) divide, enabling father and daughter to stride happily into the zoo together. At last. Like magpies, she and her Sardinian cousins “flew and settled wherever something was happening” in Orani, a small place of stucco and red tile roofs ringed by mountains. The sheer immediacy of life there renders her experiences indelible. “All I needed to learn and feel and know was down there,” she says from a perch overlooking the village. She finds her return home to crowded New York City, with its height and symmetrical layout, equally strange. The book ends with her wondering what different worlds so many people might have come from. It’s a passage with all the feeling, hope, and generosity of a prayer. Their own Oranis? They should be so lucky. This East Hampton Star post appeared online on Sept. 29, 2011. Posted by flashlightblog in Book News, Read Alouds, Reviews, Winter. Ms. Eileen of the Richmond Memorial Library in Marlborough, CT recommended Pobble’s Way on her blog, StorytimeRML. 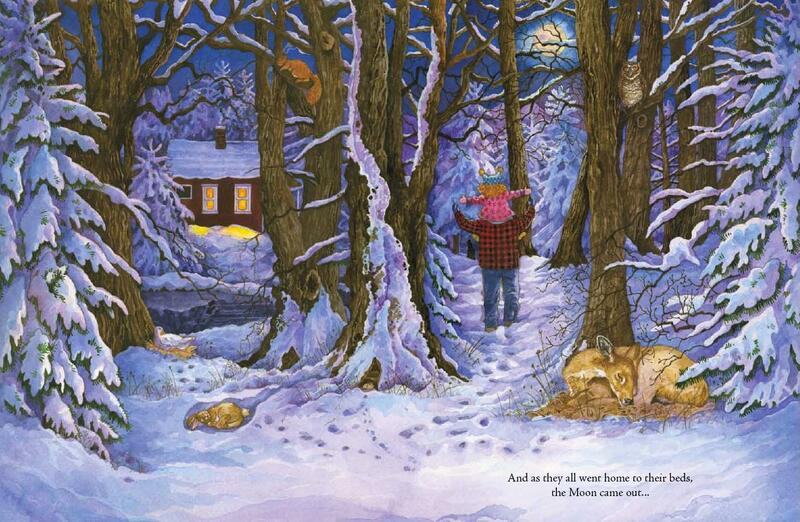 You would think the illustrations would include a lot of snowy white, but illustrator Wendy Edelson brings out the most vivid colors in the animals and scenery. This is a perfect book for this LONG winter we are having, and just may inspire you to take a winter walk of your own. Also a great choice for fathers to read and enjoy with their own little Pobbles! Posted by flashlightblog in Bedtime, Imagination, Reviews, Winter. Beautifully written and tenderly illustrated, “Pobble’s Way” eavesdrops on an imaginative dialogue just before bedtime between a loving father and daughter in a still winter woods setting that has many hidden animal friends. “Pobble’s Way” is a great bedtime story book, especially matched to fathers and daughters. The wise, imaginative comments of the animals about Pobble’s lost pink mitten will linger sleepily in the dreamings of many children. Read the full review and check out more Midwest Book Review picks here. Posted by flashlightblog in Holidays, Reviews, Winter. We imagine with Pobble, Daddy, and the forest animals; we believe that something simple is more than it appears; and we know that nature is full of possibilities. I highly recommend this beautifully illustrated and narrated book and think it would make a great holiday gift. Winter is about holidays and family and of course gift-giving. But it is also about quit walks together in the snow, the warmth of home, and the light of imagination. A gift of Pobble’s Way is all of these great winter things wrapped in one.